There are many more types of family unions, but the above will do for examples. Some similarities appear in these diverse examples. The couples I know consider themselves to be legitimate families. Each one strives to be loving, kind, and supportive of their particular “family”. Divorce or separation rates fall within the current national average. Time throws some light on the years as they pass. It teaches that slowly or rapidly, change occurs. I am not the same person I was years ago. Why am I surprised when I see different norms for today’s families? What did I expect? Is it possible the premise of what a family should be, is still alive, only clothed in different forms? I like that conclusion, and feel comfortable with it. My love of our family unit has been, and is, the major factor in my life. I cried bitterly when at first I could not conceive. When the doctor confirmed I was pregnant, Sheldon and I had a wonderful celebration. It was our great joy that we were able to celebrate three more times, at which point we decided our family was complete. Through it all, my family group was my fortress, the protection that enabled me to see the goodness of life, and to live it happily. One summer night long years ago, we were driving home from Lethbridge to Calgary. It was a calm, beautiful, moonlit night. Our four kids were asleep in the back seat. We pulled over to the side of the road to arrange the blankets over our sleeping brood. The task accomplished, Sheldon paused and looked down at them. He turned to me and said; “At the end of my life, all that will really count is what I can do for them and for you.” Then he gathered me in his arms and held me close. Of course, I cried – but they were tears of deep happiness. 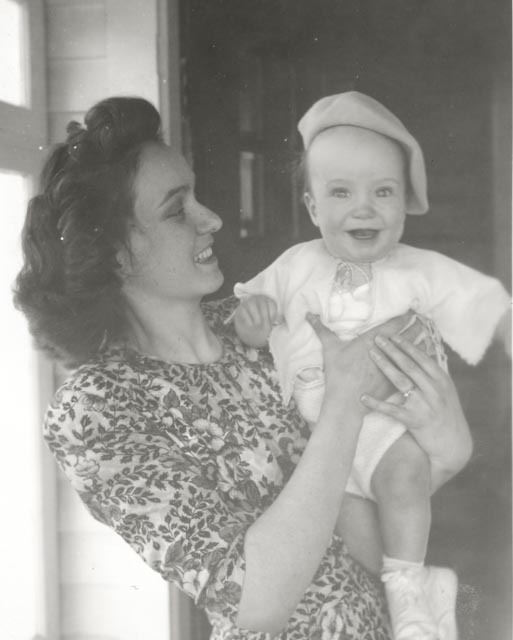 The picture of me with our first-born child, son Ralph, was taken 67 years ago. There are now many family units forming our growing family clan, in many different forms and sizes. I enjoy them all, love them all, depend on them all, and celebrate them all. Long Live the Family Concept!! It Enriches Our World. Joan – It is always good to hear from my Calgary/St. David’s friends. I agree about love and respect. We live in very different times, but one cannot lose if those two qualities live. What a wonderful essay on families! Everyone is included. Eleanor – Well, not quite everyone! Short of writing a small book, there are many more different “families” in our present society that I could have included. The ones used are samples, families that are on the surface different from what used to be traditional. Looking below the surface may change your mind. Only one small error. It can’t have been 67 years, can it ? Ralph – Sorry Son – 67 years it is! Glad you approve. I know your list wasn’t intended to be comprehensive, but there is one more class of family that perhaps deserves to be included — my daughter’s, a single parent family with children. Unlike you, she never found the perfect mate, and so in her early 40s she decided that the only way she could become a mom was to adopt. She now has two children (adopted from Ethiopia) and while they have had some emotional problems, I think they are slowly settling down to become a happy family. Jim – Your example of a modern “family” is an excellent one. Thanks for adding it to the mix. Becoming a family always means facing and handling problems, as well as being greatly enriched by the experience. It gives me joy to hear that your daughter’s courageous venture is “settling down to becoming a happy family”. I suspect you all will reap the benefits of this new family unit. Lovely to hear about that moment with dad. Thanks mom. Lorna – As you know, Sheldon was of Scottish stock. He did not easily verbalize his feelings. I never forgot that evening and his impulsive expression of love, and concern that he do all he could for his family. You children were always the most important part of his life – and I had my secure place in the circle too. Hopefully you “kids” felt his love, even if he seldom said it in words. Marjorie, this is SO touching. Thank you for your insights. Society has come a long way since our parents’ times. Ultimately, family is the important thing in our lives, whatever the structure. Sheldon had it right. I think so too, Morag. It is also comforting to know that he lived long enough to see those four little kids all become parents and some become grandparents. The whole clan loved him. No matter how it’s formed, the family has the potential to be many things — life shaping, comforting, and the source of fun and frollicking and everyday wisdom. What could be more important? Memories are wonderful Liz, and I treasure them. Now those four “kids” are middle-aged, with children (and some with grandchildren) themselves! Sheldon lived to see this, and was so proud of them. Sheldon died four years ago, after 65 years of marriage. Yes, it was special, and memories keep it near.